The newest in innovative Ford F-150 models is now available at your Mid Vancouver Island Ford Dealership. The 2018 Ford F-150 is now the perfect all-around pickup truck with the most power and technology savvy features to make any Ford fan excited. Available with the most advanced and potent engine line-up ever, the greatest Ford truck ever now offers a 2.7-litre EcoBoost engine, which made an impressive appearance in the Baja 1000, a 3.3-litre twin independent variable cam timing engine with the first port fuel and direct injection system, a 3.5-litre Ecoboost with best-in-class 280 kW as well as the legendary 5.0-litre V8 that extracts as much power as possible from every drop of fuel. Each of these engines is paired with an advanced 10-speed automatic transmission, which delivers improved overall performance, with enhanced acceleration at the low and mid ranges of the power band. Features include optimized wide-span gear spacing coupled with drag-reduction actions plus three overdrive gears. The newest Ford F-150 also delivers best-in-class payload and tow ratings, with all the equipment needed to smooth out the toughest of workdays and make every job as productive as possible. The first pickup truck to offer the breakthrough class-exclusive Pro Trailer Backup Assist technology, the 2018 F-150 makes backing up and parking two vehicles at the same time a breeze. Whether you’re a novice or a seasoned pro at this often-tricky maneuver, this technology makes the process as easy as turning a knob. Simply rotate the knob left or right in the direction you want the trailer to go and you can rest assured that everything will be just as it should. Along with power, the newest member of the Ford F-150 family also includes fuel-saving technology. Auto start-stop technology is now a standard feature on all F-150 engines. When you come to a stop, the engine shuts off to save fuel and restarts immediately when the brake is released. Designed smart for truck applications, auto start-stop deactivates when it wouldn’t be needed such as when you’re towing or running in 4-wheel drive. The class-exclusive available remote tailgate release lets you lock or unlock the tailgate hands-free, using your key fob or inside door switch. Available Blind Spot Information System (BLIS) signals you in the outside mirror when a vehicle is detected in a blind spot — and provides coverage for the truck you’re driving as well as the any trailer that you may be towing. The cross-traffic alert system also detects a vehicle passing behind when you’re slowly backing out of a driveway or parking place. Adaptive cruise control with stop-and-go technology allows you to set a cruising speed and distance from the vehicle ahead. When activated, the stop-and-go feature automatically accelerates and brakes your truck while maintaining your pre-set distance. The stop-and-go technology can bring your vehicle to a complete stop in stopped traffic and resume as traffic begins to move. Available Pre-Collision Assist with Pedestrian Detection adds to a suite of driver-assist technologies that can make your drive safer for both you and the world around you. If the system’s sensors detect a potential collision with a car or pedestrian in front of you, a warning flashes on the windshield and an audible alert sounds. The brakes will also precharge and increase brake-assist sensitivity to provide full responsiveness when you brake. If the driver does not take corrective action and a collision is imminent, brakes can automatically apply. Ford’s user-friendly SYNC interface, connects with your smartphone as well as the F-150’s 8-inch LCD capacitive touchscreen to locate your favourite places with simple destination entry via optional navigation and your voice to control some of your favourite compatible mobile apps, like Pandora or Spotify, while driving. Are you ready to get behind the wheel of the technology driven 2018 Ford F-150? 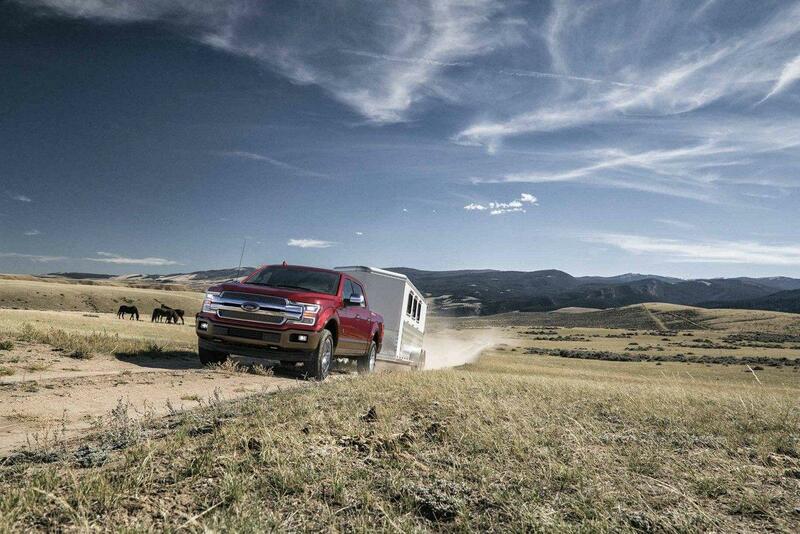 Contact Van Isle Ford today to schedule a test drive in the savviest of trucks available.